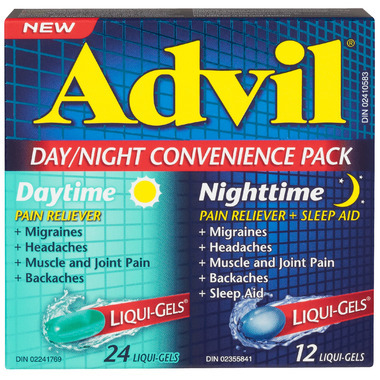 Advil Day/Night Convenience Pack offers Liquid-Fast® pain relief for your day and night pain. Advil Liqui-Gels® offer relief from headaches, muscle and joint pain, in addition to providing migraine symptom relief. Advil Nighttime Liqui-Gels offers relief from nighttime pain and it also helps you sleep so you can wake up refreshed. Directions: Adults ≥ 16 to 65 years: Daytime: Take 1 green Liqui-Gel every 4 hours or 2 green Liqui-Gels every 6-8 hours at the first sign of symptoms as needed. Nighttime: Take 1 to 2 blue Liqui-Gels at night, 4-6 hours after the last daytime ibuprofen or diphenhydramine dose. Do not take for more than 5 consecutive days/nights unless directed by a doctor. Do not exceed a combined total of any 6 green or blue Liqui-Gels in 24 hours, unless directed by a doctor. Cautions: Keep out of reach of children. This package contains enough medicine to seriously harm a child. Do not give to children under 16 unless directed by a doctor. Do not take if taking daily low dose acetylsalicylic acid (ASA, 81 – 325 mg), without talking to a doctor or pharmacist. Do not use with ASA, other ibuprofen or pain relief drugs, or if allergic to ibuprofen, ASA, salicylates, anti-inflammatory drugs or any of the listed ingredients. Do not take Advil Nighttime if you suffer from sleeplessness without pain, have pain that will not cause sleeplessness, if taking any other pain reliever, sleep aid, antinausea, or allergy medicine with antihistamines/pain relievers, or if allergic or hypersensitive to ASA, salicylates, anti-inflammatory drugs, or any of the listed ingredients. Advil Nighttime is for use only if you have short-term nighttime pain causing sleeplessness. If this is not your case, do not use. Advil Nighttime may cause marked drowsiness. In case of overdose: Stop use and contact a doctor or poison control centre immediately, even if there are no symptoms.